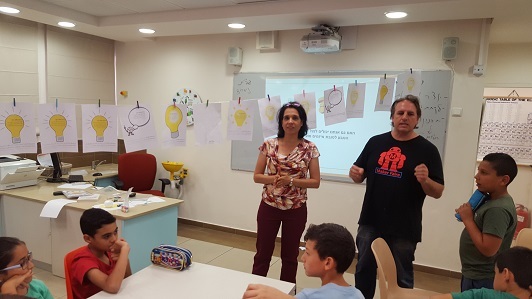 The idea of holding Hackathons for school children came from an acquaintance of Galit Zamler, with the Hackathon events among the entrepreneurial community in Israel. Hackathon events for young students in elementary, junior high, and high school are focused on entrepreneurship, and they are refreshing, diverse, and encourage entrepreneurial thinking, creativity, and teamwork. Its focus is on a goal and standing in front of an audience. 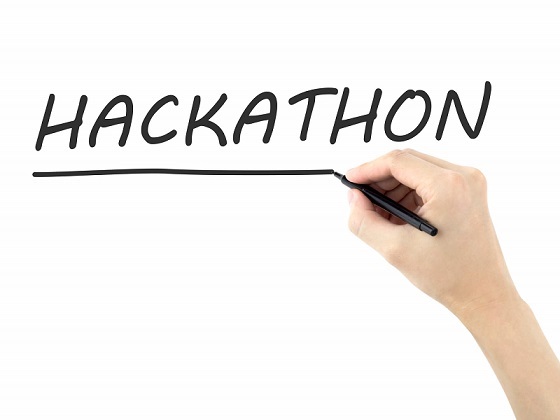 Hackathon is a combination of the words "Hacker" and "Marathon". It is an event where entrepreneurs gather together for X number of hours or days without sleeping, share initiative and ideas relating to the Hackathon theme, test them out, plan them, and produce a prototype or a presentation and pitch (a brief explanation for presenting the idea). In the end, the ideas are presented to an audience and sometimes to a panel of judges, who choose the winning projects according to specified criteria. 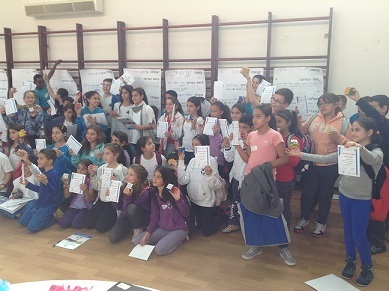 In 2014, the Entrepreneurship for Kids program organized the first Hackathon for kids. 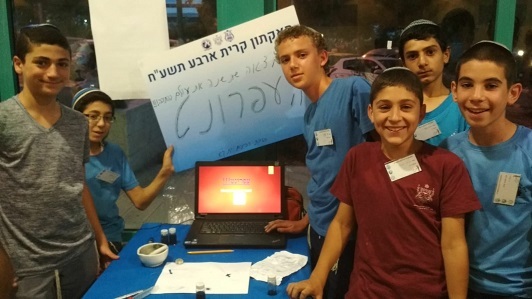 Following the success of the first Hackathon in Israel at four different schools from four different cities, other schools joined and asked that a Hackathon be organized for their students. Each Hackathon was designed in accordance with the schools' needs. Hackathons have been adapted to the needs of the schools in terms of student age, study hours, content, pace, and various abilities. In this way, Galit organizes Hackathons for students of different ages, empowering the experience of entrepreneurship, creativity, and teamwork that enables them to feel what it is like to be part of a start-up. 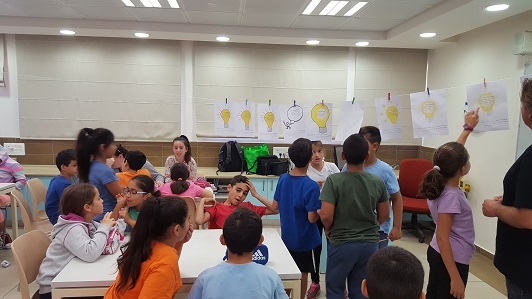 On this page, you will read about the various Hackathons participated by school children, organized by the Entrepreneurship for Kids program and the Youth Entrepreneurship program. Hackathon organizers declare what the theme is about and ask for thoughts and suggestions regarding the theme. Announcing the theme ahead of time enables forethought on the initiatives, making it possible to show up ready with whatever tools one requires to participate. Sometimes the goal is to come up with real projects that will be fully developed during the two days. Sometimes it is only to come out with a piece of paper/presentation/model and concrete ideas. During the Hackathon groups are formed - You can join in with people you know, but it is always preferred to join with people that you do not know, thereby widening your network. The event starts with a themed presentation and a lecture by someone with expertise in the subject. Depending on the length of the event itself, it is possible to schedule more lectures during this time. Group members have a meet & greet, start discussing initiative ideas, convince their friends to focus on their idea, and, together, they decide on one project. The group meeting is held in the big hall so that groups can see and run into other group members (eg. on the way to the restrooms or to drink water), impress upon their work, their progression, their ideas, and consult with each other. Every half an hour the groups must report on their progression to the event supervisors. At the end of the Hackathon, representatives from each group present their initiative ideas before the rest of the participants, expert panel members express their thoughts on each idea, and, afterward, there is a vote to rank the initiatives amongst the participants and winners are declared. Sometimes there is a prize, but other times there is not. 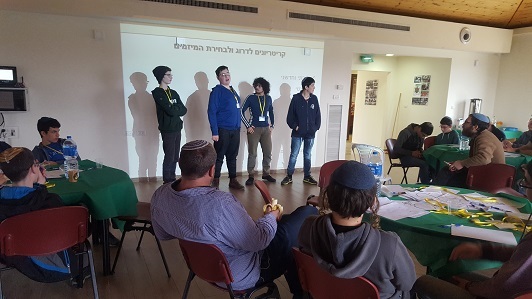 Students from six high schools in the settlements Efrat and Gush Etzion participated in a Hackathon for the first time. The Hackathon was divided into two parts: in the first part which was split into two events: one for boys and one for girls. The students learned what a Hackathon is, and how you can enjoy it and succeed in it. Although this was the first time that the students participated in a Hackathon, and they didn't know what to expect, they very quickly engaged in an open and creative mood and standing up to schedule succeeded in raising many ideas for projects. On the end of the event, every group focused on one idea based on clear requirements that were predetermined between them: creativity, ability to realize the project in the community and whether the project was relevant to the chosen theme. The second part of the Hackathon was for both boys and girls together, and went into the night. When the prizes for the winners were meant to provide initial funding for the projects' to be made. 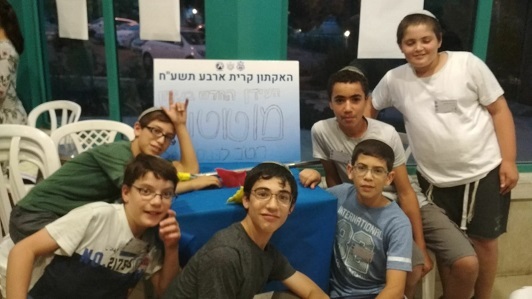 The director of education in Kiryat Arba initiated a Hackathon for seventh and eighth-grade students in the junior high school of the Yeshiva (Yatka) and for students in the 7th and 9th grade in the Ulpana. 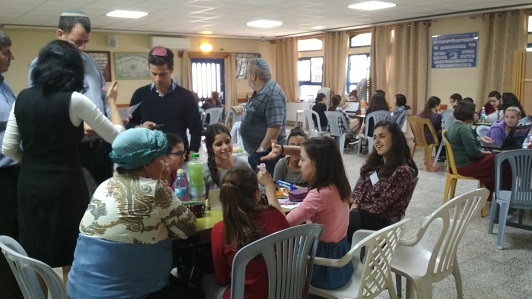 The Hackathon was divided into three sessions and it culminated in a community evening in which two finalists from each school presented their projects to the Kiryat Arba community, well-known entrepreneurs, and judges. At the first meeting, the students learned for the first time what Hackathon is, after the early publication of signs at the school aroused their curiosity. This meeting exposed the students to the subject of entrepreneurship in order to develop students' entrepreneurial and creative thinking and to encourage them to participate in the next two meetings of the Hackathon, which has limited enrollment. The exposure meeting, the teasers, the recruitment of the teaching staff, and the competitive atmosphere made more than 60 students register for the Hackathon. The exposure meeting, the teasers, the recruitment of the teaching staff and the competitive atmosphere made more than 60 students register to the Hackathon. About 30 students from the Ulpana gathered in the hall around tables and raised innovative ideas for projects on social entrepreneurship and cleaning products. Each group was accompanied by a mentor who helped them formulate ideas. 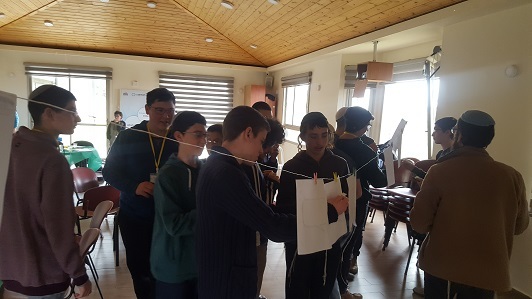 The students heard a short lecture from Galit Zamler on techniques for creative thinking in entrepreneurship and then raised many ideas for projects, which they had ranked, and only two were selected for voting. 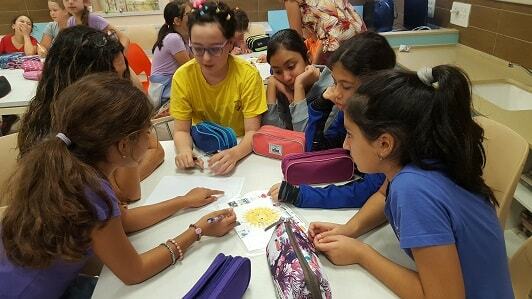 At the end of the day, six ideas were chosen with which the girls progressed toward the semifinals of the competition at the school. 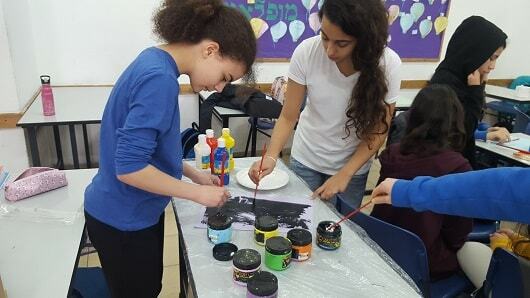 A similar event was held at Yeshiva high school with more than 30 students eager to bring up and develop innovative ideas in the fields of science, technology, and cleaning products, knowing that eventually they would compete in the finale against the Ulpana girls. 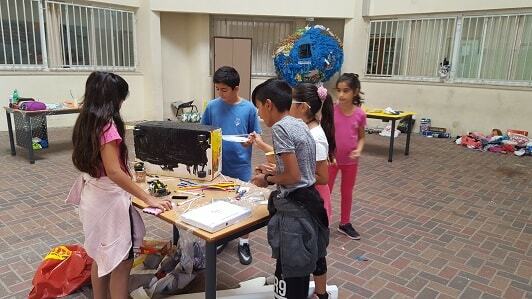 For the third encounter, the students came with the equipment and tools they needed to build a model of their ideas. 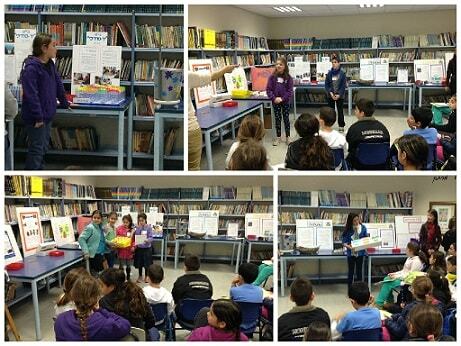 After building models, they prepared pitches and presentations to present the projects. After a few hours, the school children gathered and the entrepreneurs presented their inventions. Each school held an internal competition between the various groups. Computerized voting allowed each student to choose only two projects, by which two finalists were selected at each school. 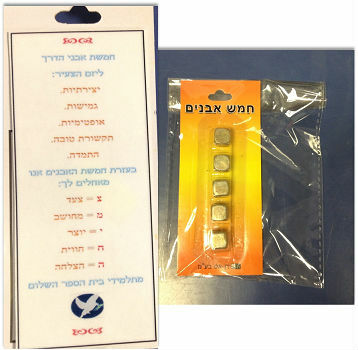 2) Easy Busy - An adjustable eraser for the school board so that it will always remain in place and will not be lost. 3) Owl Test - An owl test embedded in a vehicle to protect against drivers who drink too much alcohol. 4) Kifafa - A glove with clean dish sponge. 5) Light night - A bag that glows in the dark. 6) Cart fix - A three-wheeled supermarket cart, easier to drive. 1) Charging cart - A baby carriage that charges your phone. 2) Cool Bag - A backpack with a cooling system. 3) Electric cart - An electric supermarket cart that drives itself to make it easier for customers. 4) Removable garbage bags without the need to be replaced by. 5) Pencil Pen - Instead of lead, it has a liquid-like writing ink that can be deleted by a regular eraser. 6) Mototon - A broom with which you can clean dust covering cabinets. All the participating groups presented their projects in the evening in the Heichal HaTarbut in front of a wide audience. The four winning teams went up to the stage and presented their inventions to an experienced panel of judges. Three groups won prizes. "We finished the internal competition between the two schools. It was wonderful and impressive to see the hard work of all the groups in all areas. The students were required to prepare a representative prototype and a speech for marketing the product. There is no doubt that a combination of all of these brought the results of the voting. Of course, the target audience is also a factor. Anyway, thanks to the wonderful Galit for the special journey that the students went through. 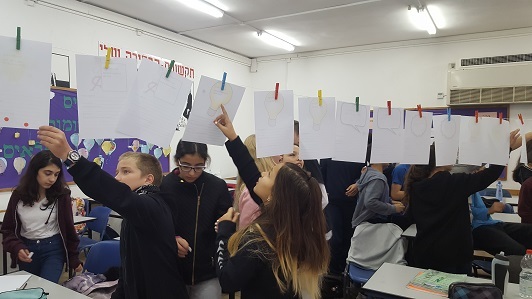 Congratulations to the wonderful teachers and staff, headed by Arie Sod in Ulpana, Rabbi Menachem Saadia, and Michael Fasi in Yatka Junior High." 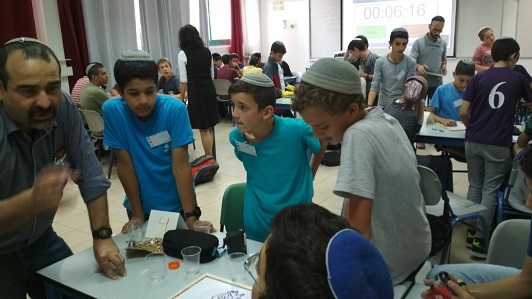 The students of the two seventh grade classes at the ORT Holon campus participated in three days of Hackathon during which they learned how to develop an entrepreneurial mindset and to think creatively about ideas for projects, in the style of the elevator pitch. Being exposed to the entrepreneurial world inspired them to think like entrepreneurs and the students began to ask many questions, both topicality and smart. All of them received answers which encouraged them to continue as critical thinkers. In the second session of Hackathon, the students chose a limited number of ideas from those raised in the first session. Then, each team focused on one project; they developed original ideas, defined a need, a target audience, why they thought the idea should be promoted, and what was needed for that. The students learned what an elevator pitch is, what it answers, and how to differentiate themselves so that others will listen to them. In the third and last part of the Hackathon, the students were creative, able to work in teams, and had the ability to cope with challenges when asked to prepare models for their ideas for projects. 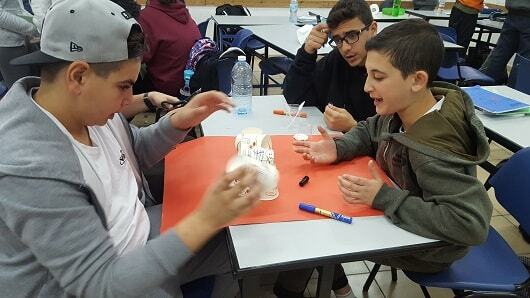 Each group prepared a model to illustrate its idea for the project using certain accessories provided to them and, although these are models of different ideas, they all succeeded in building a model that conveyed their message. 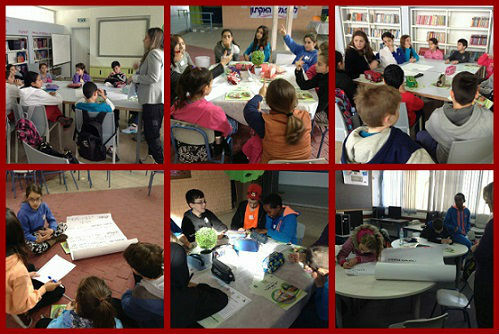 At the end of the construction of the models, the students presented the ideas in the classroom. 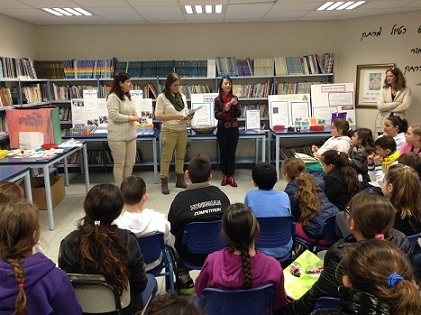 The fifth graders who learned about the natural resources participated in a Hackathon of three meetings under the direction of Galit Zamler and Nimrod Segev, during which they were exposed to the world of entrepreneurship, ideas for projects that use natural resources, and prepared modules for their ideas. During the first encounter, students were exposed to the entrepreneurial world in the context of natural resources. They saw how innovative projects that exploit natural resources can improve the environment in which we live. They then began thinking about the professions that will become redundant in the wake of those ventures and which new professions may be needed because of this. After the exposure stage, which excited each and every one of the students, they were given a task to work in groups. Each group received a panel that helped them to think about creative entrepreneurial ideas, which made use of the sun and water as natural resources. Each group formed 2-4 ideas for projects and, at the end of the meeting, we hung up all the ideas of the students in the class so that everyone could see them. 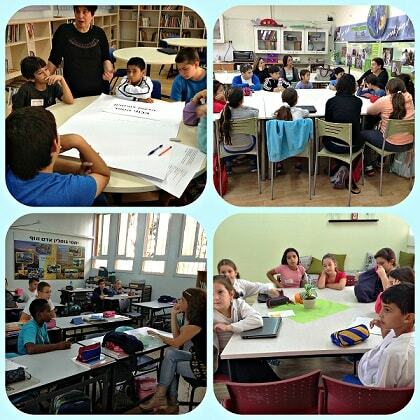 In the second session, the students voted for the projects that they would most like to implement. They then analyzed the need for the project, the target audience, what it takes to complete the project, and who their competitors are. At the end of the second workshop, the students presented the idea to the class, while paying attention to the correct stance when in front of the audience, and their classmates helped them to understand what was needed to implement the projects. The last meeting was named "Hackathon". Prior to this meeting, the students brought the equipment and accessories needed to build models for their ideas. First, in order to focus the children just before building the model, they gave their product a name, defined the need it meets and the target audience, thought of a marketing slogan, asked research questions about the project, and drew a diagram of the model that they were planning to build together. 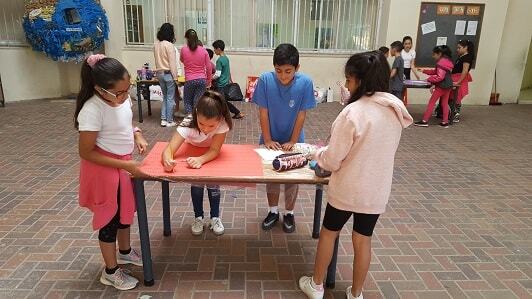 The children enjoyed the whole process, especially from the model building stage in teams, and at the end of the day presented the models they built to their classmates. 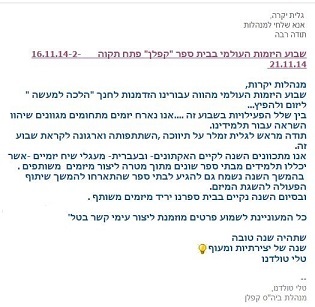 At the end of the meeting, school principal Dorit Nevo wrote: "Amazing process! Recommended for all ages." Nimrod and Galit Thank you very much!!! 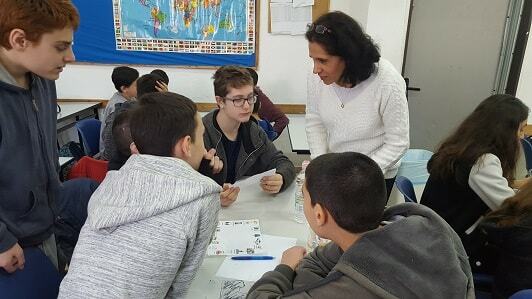 A real example of meaningful learning"
Students in the Amirim program at Hashalom school in Mevaseret Zion participated in their third year of entrepreneurship lessons from the Entrepreneurship for Kids Program, led by vice principal Sigal Bar. Bar organized a real 24-hour Hackathon event at school. 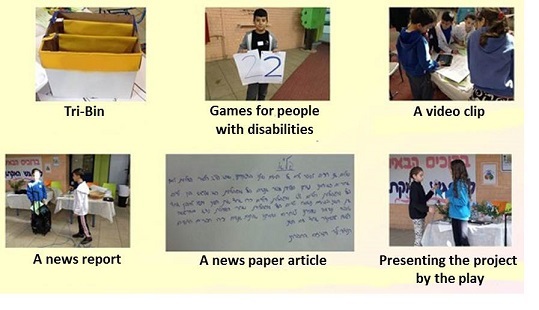 Yesterday, a group of students from the Amirim program graduated from the 3-year entrepreneurial studies program, led by Sigal Bar, in which they learned about the entrepreneurial world, met entrepreneurs, developed business, social projects, and even got published in the newspaper. This year, each young entrepreneur developed his or her own project. 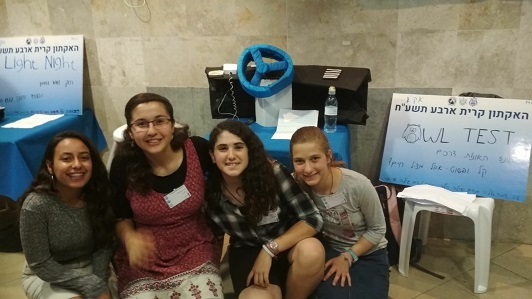 The prototype projects were created by the students yesterday during the 24-hour Hackathon, which included: creating prototypes, relaxing activities, lectures on entrepreneurial rhetoric by Ronit Meiri, and marketing styling by Sharona Zohar. The students worked at the school and completed the construction of prototypes at 3:00 a.m. The final products are amazing and creative. 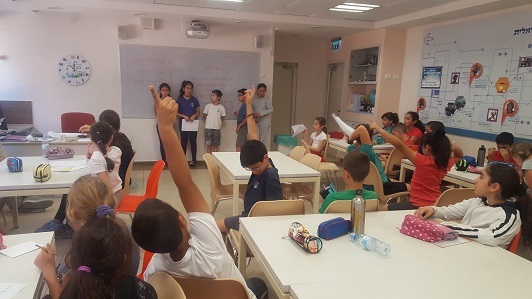 The future generation of HaShalom students are ready, sharp, creative, love to learn, curious, and, most of all, proactive and well-adapted to the 21st century. Thank you for your guidance over the years! 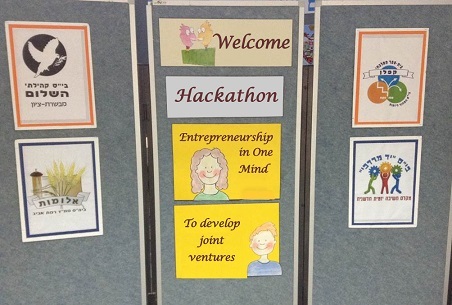 The first Hackathon for elementary school students began during the 2014 Global Entrepreneurship Week. The Hackathon was divided into three meetings; each one was held at a different school and was attended by others. 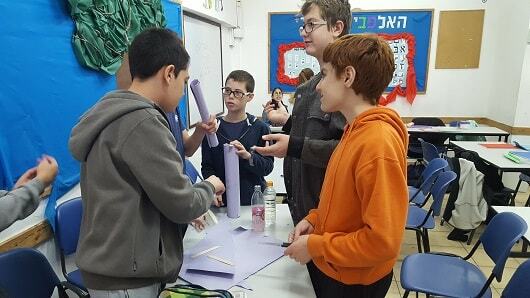 Participating schools: Kaplan from Petah-Tikva, Yad Mordechai from Bat-Yam, HaShalom from Mevaseret Zion, and Alumot from Tel-Aviv. 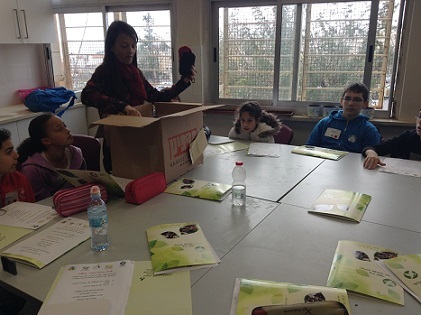 TThe first to raise her glove was Tali Toledano, Kaplan school principal in Petah-Tikva that has engraved on its flag the education for entrepreneurship. Tali immediately connected with the Hackathon idea and asked to participate in it along with other schools. Please forward the following to the principals. Thank you. The Global Entrepreneurship Week gives us a chance to teach practice, initiative, and distribution. Of the many programs during this week, we will host entrepreneurs from different areas that will inspire our students. Our gratitude goes out to Galit Zamler for her mediation, participation, and organization toward this week. 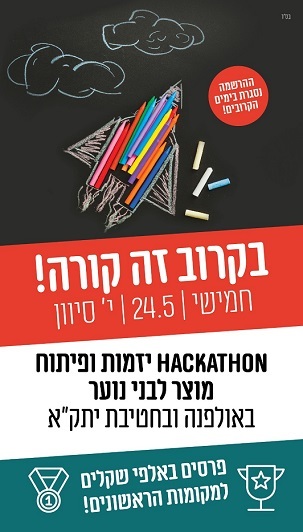 This year, we plan on holding Hackathons in Hebrew; entrepreneurship conversations that will include students from different schools with the goal of creating cooperative initiatives. During the year, we will be happy to come to schools that took part in the week and continue working together to further our initiatives. At the end of the year, we will hold a cooperative initiative fair. Those interested in more details are welcome to contact me. Have a great year. A year of creativity and flight. Three schools answered the call - two principals and a vice principal that, like real entrepreneurs, came out of their comfort zone and decided to join the Hackathon, even though they have never participated in one before. We shall note that this is exactly how we educate entrepreneurship. 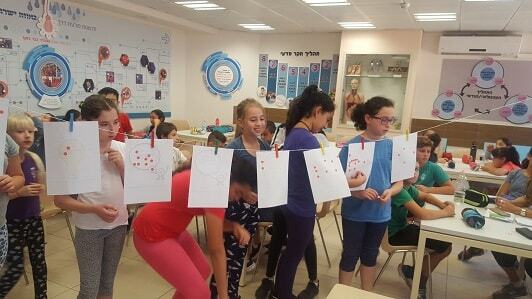 Yad Mordechai in Bat-Yam, run by Avivit Misterial, that teaches entrepreneurial forethought. 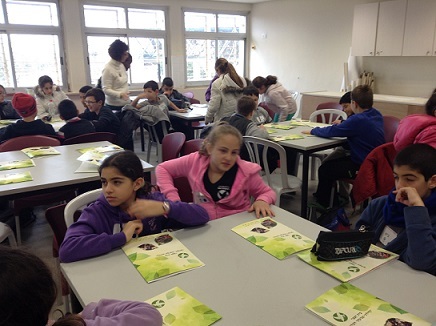 Alumot school in Tel-Aviv, run by Anat Blair, which joined the group of schools teaching entrepreneurship in September 2014. 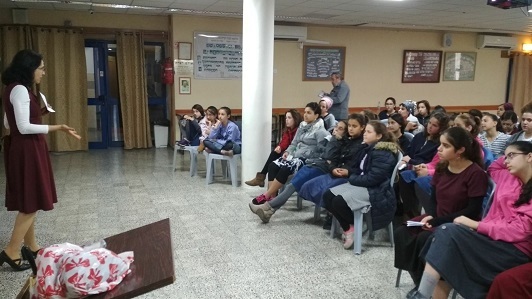 HaShalom school in Mevaseret Zion, lead by vice principal Sigal Bar, who teaches the Entrepreneurship for Kids Program to a group of honor students. Thus, Hackathon was born - participated by 4 different schools from 4 different cities, encouraging entrepreneurship for young students. The first meeting was designed to be a meet & greet between entrepreneur students, focusing on five subjects, of which initiatives will arise from choosing 2-3 ideas chosen for each subject. 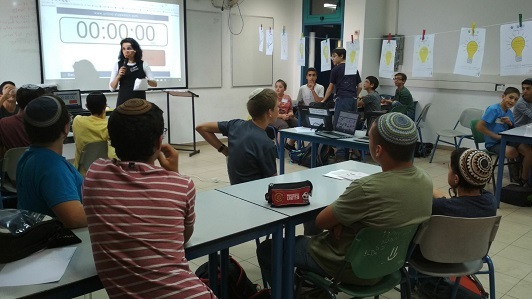 At Kaplan school, a team lead by the science teacher, Liat Ben-Moshe, was chosen and the team planned the first day of the Hackathon meticulously. This very special event was named Hackathon - a one mind initiative a name that expresses entrepreneurial thought shared by students from different schools across the state. 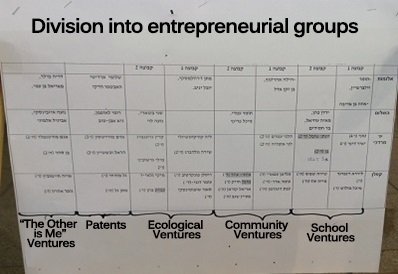 The subjects defined for initiative idea hashing were: technological initiatives - patent invention, school initiatives, social initiatives, ecological/environmental initiatives, and initiatives on the other subject was me, Galit Zamler. Every subject was given a color. Students from the four different schools divided into groups ahead of time, based on subjects and showed up with ideas for initiatives. Badges were made for the students with their name and colored according to the subject. Thus, the students could identify their groups before getting to know students from the other schools. 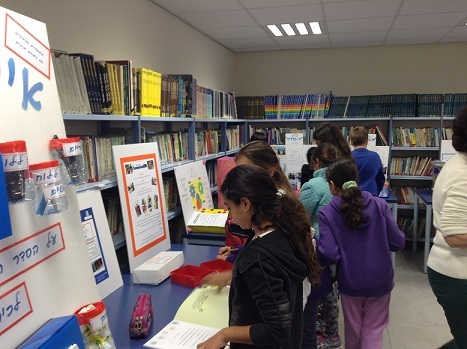 The first Israeli Hackathon for students grades 4-6 was set for November 19, 2014 during the Global Entrepreneurship Week. Excitement filled the morning air, as buses with students from entrepreneur schools arrived. Tables were set out by groups and categories in the school auditorium. Upon arrival, the students wore the badges that they had made ahead of time. After the assembly at the hall, a meet & greet was held for group members using an acquaintance game in the vein of "Truth or Dare". Questions were thought of ahead of time and aimed at the initiative subject. Afterward, the entrepreneur kids shared initiatives they had worked on iwith their schools and, together, worked on an Initiative basket - enriching every school's knowledge. When everyone felt acquainted, they began presenting their initiative ideas to the other group members. 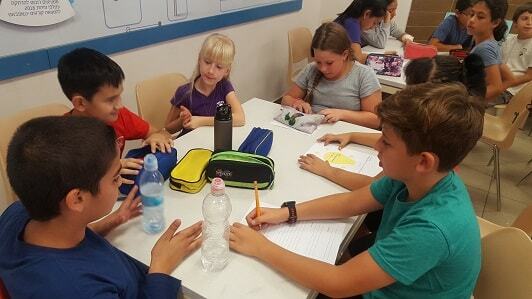 At this stage, in order to provide a calm and quiet environment for discussion, the groups moved to other areas of the school, accompanied by a chaperone teacher who also helped to guide the idea-sharing process. - Who thinks the idea is good? - Who thinks the idea is important? - Who thinks the idea can be common for all schools? The answer to each question was given using colored cards of red, yellow and green. This is how, in every group, up to three initiative ideas were chosen. All ideas that were eventually picked and written on construction paper. At the end of the day, the ideas were all assembled in the main hall and proud students took photos with their ideas and diplomas for their participation in the first Israeli student entrepreneur Hackathon. The first part of the Hackathon came to a close with the creation of a joint market poll, uploaded by the students using Google Docs, and it was their task to show up with poll results to the second part of the Hackathon. I enjoyed it. The kid's points of views were unlike the adult's. I enjoyed seeing the kid's respect for one another, the encouragement, the cooperation, and group thought even though they did not know one another. I feel as if after birth. During a month and a half I worked on all the small details and coordination and to see the final product at the end was amazing. In my mind, the kids did not need us. They are enthusiastic and look forward to the next meeting. The kids are coming together by themselves, which is an initiative with meaning. And this is far greater than the exchange of ideas and opinions. I understand this is how a Hackathon works, but I was missing a lot of time. It was wonderful. Talking to the kids about what you learn outside of school, identifying a need, a problem, an opportunity for initiatives, and encouraging out-of-school thinking. I developed the tool for choosing between alternatives, which we used to vote for the top ideas. I have no doubt we are dealing with quality, charming kids; I felt like we were all of the same school. It was delightful and very well organized. There were many ideas. Thank you for hosting and for the idea. The meeting was great; the organization and fruitful thinking of the kids. You managed to transport them to far away places in a small amount of time. The art of cooperation that brings the kids to a sort of small global village is amazing, and that's not just a saying, it's a reality, too. Cooperation between schools should be encouraged. It was a phenomenal visit and brought out the best in the kids in terms creative thinking. An empowering, straightening project. It's heartwarming to see how much willingness the kids have to create initiatives, to produce, to cooperate. The way they spoke to each other despite not knowing one another, the involvement, the caring, the goals they set for themselves for future mutual initiatives? The climate created between the kids is something that can go forward. When we heard how they conversed and listened to one another, we saw that the sky was the limit. I was in the group for "The Other is Me" and had fun. We brought up all kinds of ideas, like how to open a dialog between healthy and physically challenged people. We cooperated and succeeded, and had many ideas. We worked well together and came up with a lot of initiatives. It was fun. My group's subject was the environment. We cooperated well. Everyone pitched an idea; we had many. I felt the consolidation with the group. 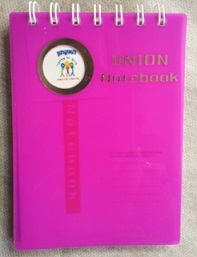 My group dealt with initiatives within the school. It's a subject that I very much like because I like giving to the student body. Hashing out ideas and working together was fun. I enjoyed improving ideas and no one was shy about sharing their thoughts. Coming up with ideas was fun, and there was a lot of cooperation. My group was 'the other is me' and we worked well together; it was fun. My group's subject was 'social initiatives'. It was fun to come up with activities. We worked together and had a good time. We were open-minded and creative. We developed many initiatives that will benefit both ourselves and others. It was a lot of fun and we connected. We worked together, even after splitting up into groups. It was fun to work with kids I didn't know. We came up with some great ideas and enjoyed ourselves. It was good to meet kids from other schools and listen to their ideas. I had so much fun working with the team because there was no fighting; there was cooperation and it was pleasant. My group dealt with 'technological initiatives'. We discussed patents to improve the school. For example: when kids get up to throw paper away in the bin, it disrupts the class, and so we thought there could be a small bin for every group of kids. Therefore, fewer kids have to get up. We came up with other patents to benefit the school, as well. 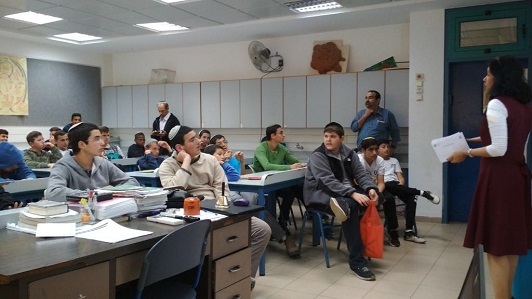 The second part of the Hackathon was held on 12.29.2014, and the host school was Yad Mordechai in Bat-Yam, run by Principal Avivit Ministerial. 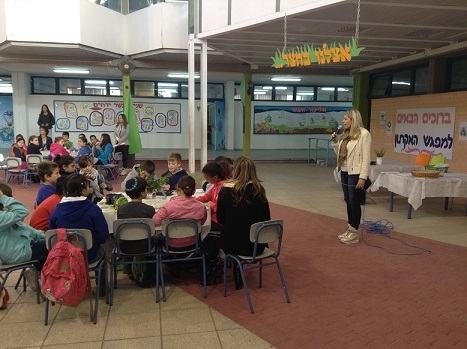 Orly Maimon, entrepreneurship coordinator, and Ronit Cohen, Innovations coach at the school, planned this entire day. 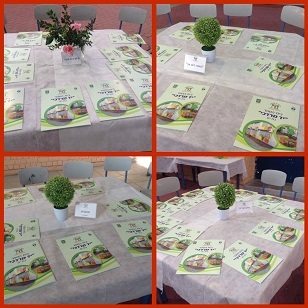 In the inner hall at the school where all participants gathered, the tables were set by subject initiative groups. 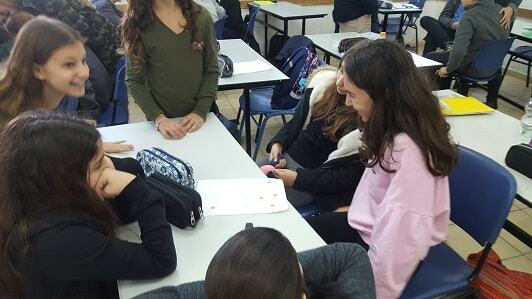 Every student was given a Yad Mordechai folder and in it was the schedule for the day, business cards to be filled out, and other materials to serve them throughout the day. 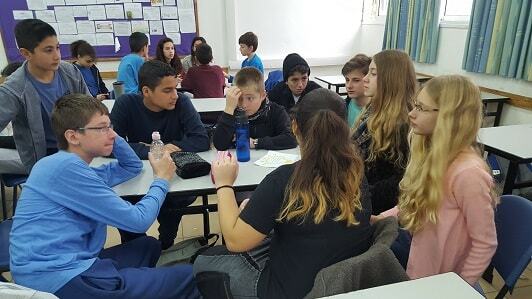 After an acquaintance exercise, the students divided amongst themselves into work groups, each accompanied by a chaperone from the school. Karen, a teacher, guided one group, the second group by teacher Ronit, the third by Sigal, the fourth by Michal, and the fifth by Orly. The group's first task was to reduce the number of ideas chosen during the first part of the Hackathon down to one idea per group. The students discussed the ideas, trying to convince other groups to follow theirs and then a vote was held using stickers - every student placed five stickers that were given to them atop the ideas they liked. The idea earning the most stickers was titled the winner. Bringing the initiative to life - using a model, drawing, presentation, article, etc. Pleased with the choices they've made and furthering the initiatives, the young entrepreneurs assembled in the hall. 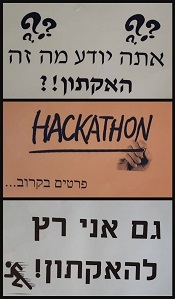 Hackathon part 3 was planned to be hosted at HaShalom school in Mevaseret Zion. By then, the students will have worked to create at least one of the Ideas chosen by their schools and will share the experience. 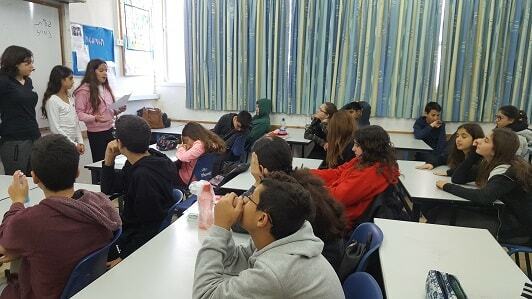 Before the students dispersed, they received a gift from the hosting Yad Mordechai school: a pocket book specially designed for the entrepreneurial atmosphere. -	I learned about the hardships, advantages, and disadvantages of being an entrepreneur. It'll be easier from now on. -	I learned that if I want it, I can make it! - It was really fun, I enjoyed and learned how to develop an idea. It was special. I did not think we could do that. - I really enjoyed it. I felt that there was cooperation and everyone thought about creative ideas. - I really enjoyed it. It was fun to cooperate with children from other schools that I do not meet every day. 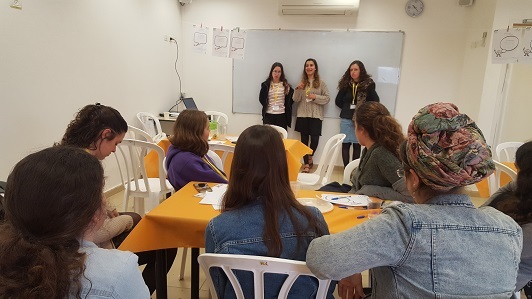 The third part of the Hackathon was hosted and organized by HaShalom school in Mevaseret Zion, led by Principal Zehava Isaschar and her VP, Sigal Bar. Students met each other at 9 AM at school and already felt acquainted. The young entrepreneurs received stickers with their name and a colored sticker, determining which of the four mixed groups they were assigned to. Everybody gathered in the hall, where folders with the Hackathon schedule and information about the hosting school were waiting for them. 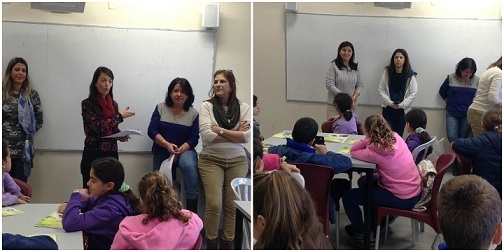 Zehava Isaschar and Sigal Bar spoke with the entrepreneur kids about the process they had gone through thus far and what they could expect during the day to come. What defines the entrepreneur kids is the ability to dream and the desire to initiate and create new processes. The kids received their blessing for the fun day to come with plenty of beautiful ideas. After the opening speeches have concluded, the kids played an acquaintance game. The kids split into groups according to the colors on their stickers. Every group's task was to stack the cubes, using the ropes they were given, without speaking to each other. 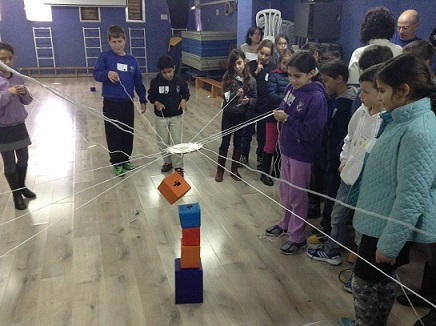 The purpose of this challenge was to encourage cooperation between group members in order to obtain a mutual goal. After succeeding, the kids once again gathered in the hall for the next activity. Every student group was asked to create one business card that defines their members as entrepreneurs, as Hackathon participants or the initiative that they've developed since Part Two. At their disposal was construction paper, crayons, glue, and other tools for designing a unique card. Prior to the task, a discussion was held on the importance of a business card as a means for marketing. After the cards had been made, they were concentrated into a showcase with the initiative models made by the students at their own schools since Hackathon Part Two. At the end of the show, group representatives presented their initiatives. You had three great meetings, every meeting different from the last. During these meetings you mingled, discussed, thought, planned and created. It was a great pleasure to watch you work together, even though you did not know each other beforehand. We're sure you're walking away with a positive experience. Your ideas are deserving of adoption and creation. Every student received a certificate of participation and five stones for the young entrepreneur. These stones symbolize creativity, flexibility, optimism, communication, and persistence. 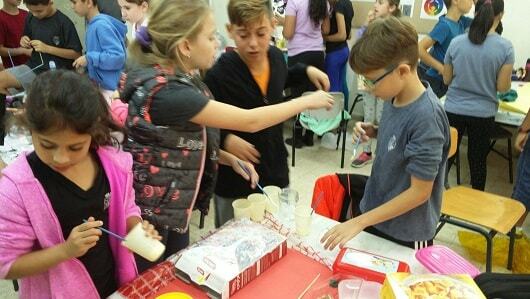 Free Class magazine, who wrote an article on young entrepreneurs at HaShalom school, also wrote about the Hackathon. You are invited to read all about it. This is the conclusion of the first Israeli Hackathon for student entrepreneurs. Read about more experiences at schools teaching entrepreneurship.